How plausible is the GOP’s lower chamber goal? A Republican at the end of 1928 could look back on the previous few decades and smile: His party was quite clearly the dominant force in American politics. Starting in 1896, Republicans had held the White House for 24 of 32 years, interrupted only by the GOP split that helped Democrat Woodrow Wilson get elected in 1912. * Another Republican, Herbert Hoover, was about to stretch that streak in the White House to 28 of 36 years. In the House, Republicans also had held control for 24 of 32 years, and Hoover’s 444-electoral vote landslide in 1928 boosted the House GOP majority to 270 seats, a Republican edge whose size was only eclipsed by the 302-member Republican caucus elected in 1920 (the House expanded to its present 435 seats in 1913). Things appeared so bleak for the Party of Jackson that “there was real fear at the time that the Democrats would follow the Whigs into oblivion,” according to the recently deceased prolific historian Robert Remini in The House: The History of the House of Representatives. Of course, the stock market crashed in 1929. Democrats would recapture the House two years later — and hold it for 60 of the next 64 years. Since that 270-seat Republican majority, the high water mark for the GOP in the lower chamber was 246 seats, achieved in 1946. That majority was wiped out two years later in President Harry Truman’s surprising reelection triumph. As of now, the GOP House majority — virtually assured of continuing for at least one more cycle — stands at 234 seats. A gain of 13 seats would put the Republicans at 247, eclipsing 1946 and delivering the biggest GOP majority since the Roaring ‘20s. The National Republican Congressional Committee and its chairman, Rep. Greg Walden (R, OR-2), have set their sights slightly lower: 245 seats, or a net gain of 11. “Drive to 245” sounds better than “Revvin’ for 247” or “247th Heaven” (sorry, best we could come up with), which probably played into the creation of that message. So too did the fact that even a modest, double-digit gain is going to be a challenge this year for Republicans. In a chamber where a simple majority rules, the difference between whether the ruling party has 234 seats or 245 seats — or somewhere in between — seems rather unimportant at first blush. But don’t tell that to Speaker John Boehner (R, OH-8) and his leadership team, who often have trouble getting their caucus to go along with their plans. More Republicans, particularly more Republicans from marginal districts who have general election voters to answer to as opposed to primary voters to satisfy, probably means more votes in the speaker’s pocket. To be clear, the overall House atmosphere favors Republicans. The president’s party almost always loses seats in a midterm: an average of 33 seats per election in the 38 midterms held since the start of the Civil War. Of course, those elections often come after the president’s party was elected with acclaim two years prior to the midterm, inflating the president’s party’s numbers in the House to artificial heights, but President Obama and his Democrats are already at a rather low ebb in the House, where they hold just 201 seats (assuming two safe Democratic vacancies in NC-12 and NJ-1 are filled by Democrats in upcoming special elections). President Obama’s approval rating is 43%, two points lower than where he was on Election Day 2010. The national House generic ballot is roughly tied, although these polls generally have a built-in Democratic slant, so Republicans probably have a tiny edge in all actuality (though considerably smaller than 2010 at this time). 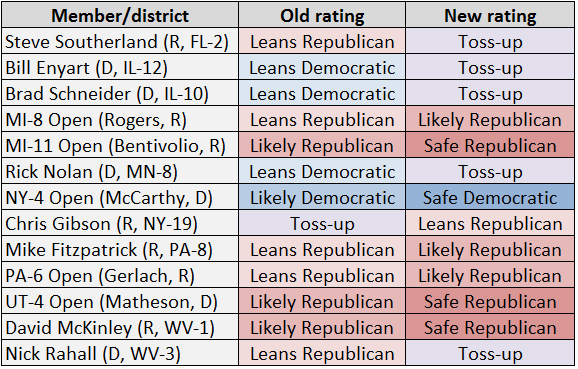 But the GOP is limited in the sense that the House playing field is small: The most recent Crystal Ball House ratings list just 37 seats in the most competitive categories, Toss-up or Leans Democratic/Republican. Of those seats, 21 are currently held by Democrats and 16 by Republicans. This is a much smaller number than in previous cycles. For instance, in 2012 around this time we had 59 races in the most competitive categories, and in 2010 we listed 69 seats in these categories. Even if there’s a wave coming — and there’s not much sign of that right now — there are only so many Democratic seats that would get swept up. What follows is a gaming out of the most competitive House races, and also how the Republicans could potentially get to an 11-seat gain, and their goal. Interspersed in the description of the state of play below is explanations of 13 House rating changes we’re making this week, which are listed in Table 1. Just to be clear, the Republicans start with 234 seats they hold right now, and the Democrats start with 201 (again, assuming they hold the two safe, open seats). Republicans should immediately start with two pickups: NC-7, a heavily Republican seat being vacated by retiring Rep. Mike McIntyre (D), and UT-4, which we’re moving from Likely Republican to Safe Republican this week. This seat is being vacated by Rep. Jim Matheson (D), who barely hung on against former Saratoga Springs Mayor Mia Love (R) last cycle. Love is running again and should be fine against Doug Owens (D), the son of former Rep. Wayne Owens (D). That gets the Republicans to 236, or +2 net. But Democrats have a couple of pickup opportunities of their own: an open, Democratic-leaning seat in California (CA-31) and NY-11, where Rep. Michael Grimm (R) is under indictment. Both these seats are rated Leans Democratic. Let’s say they go to the Democrats. That puts the GOP back at 234. CO-6, where Rep. Mike Coffman (R) and former state House Speaker Andrew Romanoff (D) are locked in a race long seen by the Crystal Ball and others as a Toss-up. IA-3, an open seat where former state Sen. Staci Appel (D) and surprise nominee David Young (R), a former chief of staff to Sen. Chuck Grassley (R-IA) who won a convention in June after finishing fifth in an earlier primary, are locked in a Toss-up race. FL-2, held by Rep. Steve Southerland (R). Southerland, a somewhat weak incumbent, is facing Gwen Graham (D), daughter of former governor and senator Bob Graham (D) and an impressive challenger. We now see this race as a Toss-up instead of Leans Republican, as do both parties, even though this Florida panhandle seat gave Mitt Romney 52% of the vote in 2012. NJ-3 and VA-10, two open, suburban seats that we rate as Leans Republican. Let’s say, for the sake of argument, that Democrats win just one of these five races: One of CO-6, FL-2, or IA-3. In this scenario, Democrats have netted just one seat. Let’s now move to where the Republicans are playing offense. They have a longer list of targets, but there aren’t many gimmes here, either. We’ve previously listed long-serving Rep. Nick Rahall (D, WV-3) as an underdog in his coal-country seat, where Mitt Romney won 65% in 2012. We still think Rahall is in deep trouble: Democrats have had a very hard time holding seats like his in the Obama era. But we also believe that Rahall is leading at the moment. It seems unfair to the incumbent to call him an underdog when he’s leading the race, so WV-3 goes back to Toss-up from Leans Republican. We’re very skeptical of his ability to hold on, though. 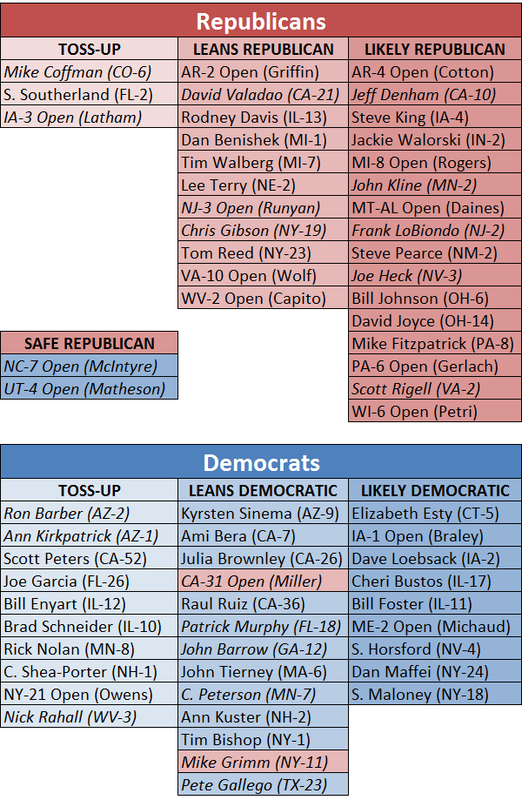 Rahall joins a somewhat crowded — and growing — list of Democratic Toss-up seats. We now list 10 Blue seats in this category; along with Rahall, we’re adding three other Democratic incumbents here, all of whom are being downgraded from the Leans Democratic category: Reps. Bill Enyart (D, IL-12), Rick Nolan (D, MN-8), and Brad Schneider (D, IL-10). Nolan, who served three terms from 1975 to 1981 before making an improbable comeback in 2012, is locked in a tough race against wealthy businessman Stewart Mills (R), and Israel singled Nolan out by name as a race he was worried about (translation: “Rick, raise more money!”). In Illinois, Democrats are worried that the struggles of Gov. Pat Quinn (D) might trickle down the ballot, and Schneider and Enyart face good Republican opponents (former Rep. Bob Dold and state Rep. Mike Bost, respectively) to boot. IL-10 has a history of backing moderate Republicans, like Sen. Mark Kirk (R-IL), but at 58% Obama in 2012, it’s more Democratic than any district held by any Republican across the country. IL-12, located downstate, is ancestrally Democratic but trending Republican (just 50% Obama in 2012, worse than his national average). Illinois is a very important state for Republicans in the “Drive to 245,” and to add seats there, they’ll have to crack a Democratic gerrymander. By the way, the overall map is probably getting smaller, not bigger. For instance, we’re moving the open NY-4 from Likely Democratic to Safe Democratic: This is a seat where Republicans could hypothetically compete, but they have been scared off by the immense resources of Nassau County District Attorney Kathleen Rice (D). Also, Republicans had been trumpeting the candidacy of former Microsoft engineer Pedro Celis (R) against Rep. Suzan DelBene (D, WA-1) — NRCC Chairman Walden singled him out by name in a sitdown with DC reporters last week — but Celis might not even advance out of Washington’s top-two primary, although many votes still remain to be counted. That race remains Safe Democratic for now. They still have other targets, just not ones we believe are Toss-ups at this stage of the game. For instance, Reps. Ami Bera (D, CA-7), Tim Bishop (D, NY-1), and John Tierney (D, MA-6) all have had tough races in the past and could drift into Toss-up territory. And Reps. John Barrow (D, GA-12), Pete Gallego (D, TX-23), Patrick Murphy (D, FL-18), and Collin Peterson (D, MN-7) all sit in districts won by Romney in 2012. The “Drive to 245” will require the GOP to win about two-thirds of the most competitive races this year. That’s doable if the national winds start blowing more clearly in the Republicans’ advantage, but for now we’re sticking with a GOP gain of five to eight — and it’s not obvious that the next revision of that range will move in the Republicans’ favor. Unlike this year’s Senate map, the competitive races this year are not being held on obviously Republican turf. To put this in perspective, it’s possible — though perhaps not plausible — for Republicans to net the six seats they need to flip the Senate simply by winning six Democratic-held Senate seats in six states where President Obama won less than 42% of the vote. By contrast, President Obama’s average performance in each of the 37 most competitive House seats was 49% in 2012, which is only a couple points less than his national average. This presents the GOP with a challenge, but also an opportunity: The Republicans elected from these districts are generally — generally — going to be among the GOP caucus’s more moderate members, assuming they want to get reelected in what probably will be better Democratic conditions in 2016. So new representatives from these districts might be good soldiers for leadership if they feel like leadership is doing things that will help them get reelected. The battle for control of the House is basically over: Democrats just don’t have the targets or the national sentiment to net the needed 17 seats to flip the chamber. A small net Democratic gain — or even a status quo election where neither side nets any seats — would be a considerable achievement for them. But the size of the Republican majority is still up in the air, as well as whether the party can reach its small but ambitious goal — let alone get the GOP to heights in the House it has not seen since before Black Tuesday ended a seemingly permanent Republican majority more than eight decades ago. Notes: Members in italics hold seats that the other party’s presidential candidate won in 2012. A red-shaded seat in the Democratic column or a blue-shaded seat in the Republican column means that the incumbent party is an underdog to hold the seat. To see the full ratings for all 435 seats, click here. *To be fair to Wilson, he won reelection in 1916 against a single Republican opponent, Charles Evans Hughes, after the Republicans/Bull Moose split handed him the White House on a silver platter in 1912.